Valentines Day at Campbell University in 1989 contained a dance, big dresses, and cute couples. While we might not be having a dance, not much has changed. After reading the story about the event, it is evident the same things are expected out of Valentine’s Day today. A “knight in shinning armor” and red, white and pink balloons are things people think of when they hear this cliche holiday. Another thing that hasn’t changed is a student’s love for food. 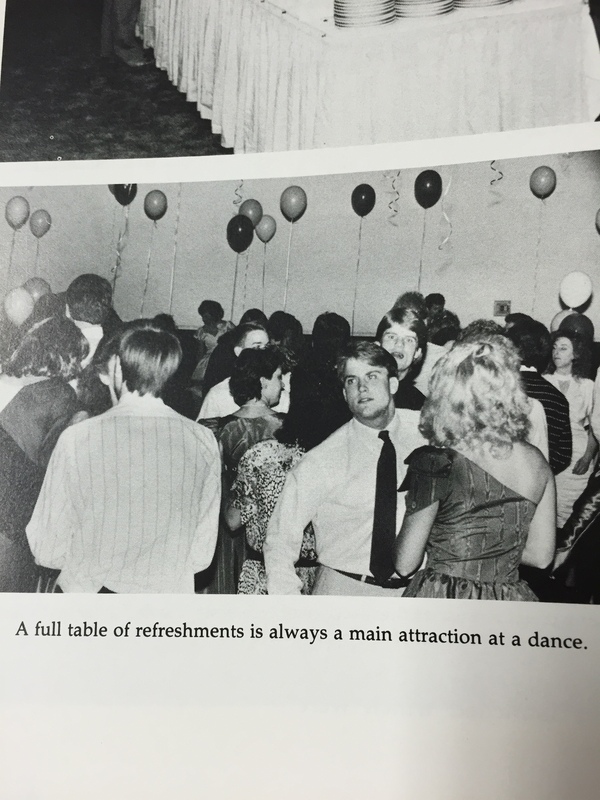 The caption reads “A full table of refreshments is always the main attraction at a dance.” This is certainly still true today. We college students are drawn to an event if there is going to be good free food and the dances that CAB puts on today (especially spring formal) is known to have delicious food. 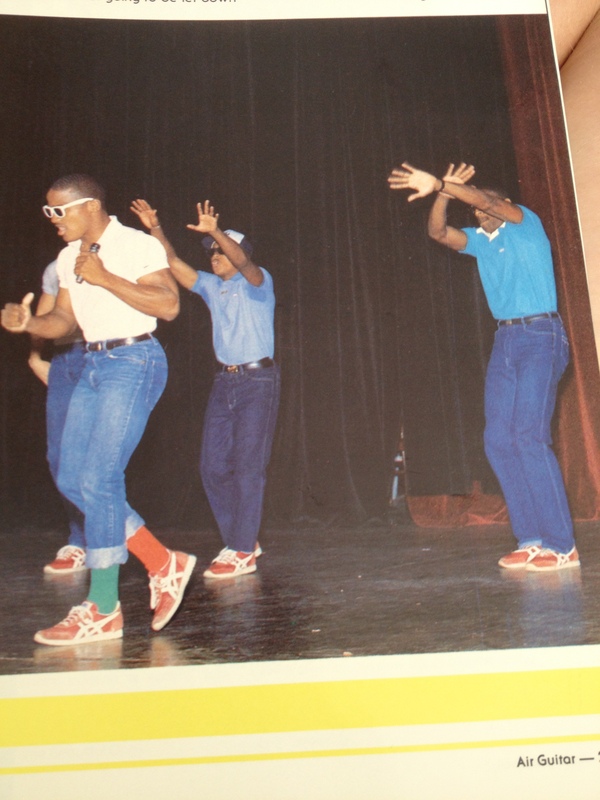 The students in this picture attended Campbell in 1986 and clearly enjoyed getting their groove on. Dancing at Campbell is something that is timeless and people will never grow tired of. This particular picture was taken from an air guitar and lip-sync contest. Music and dancing are a big part of everyday life. Here at Campbell, CAB puts on events frequently involving music and dancing. This year events have already included Paint-U and the Rip-Off. Tonight, if you want to be a part of fun music and dancing events, come out to the Zumbathon at 7 pm. Especially if you want to have another opportunity to be in the yearbook just like these students from ’86. Just remember, have fun! Brittni Adams, Club Dance President and Captain of the Dance Team, tells us what life is like for her as a Fighting Camel. She tells us the pressures of representing Campbell University and how she juggles all her responsibilities on top of all of her studies. Q. What inspired you to pursue dancing? A: Well, when I was 5 years old, my mom put me in dance classes and I was in cheerleading as well. My mom was a cheerleader since she could remember, so it was a family tradition. Cheering was fun, but dance also felt more natural to me, so I started doing dance during middle school, but could only could pursue one or the other because of AP classes in high school. I chose cheerleading but part of me still was very interested in dance. 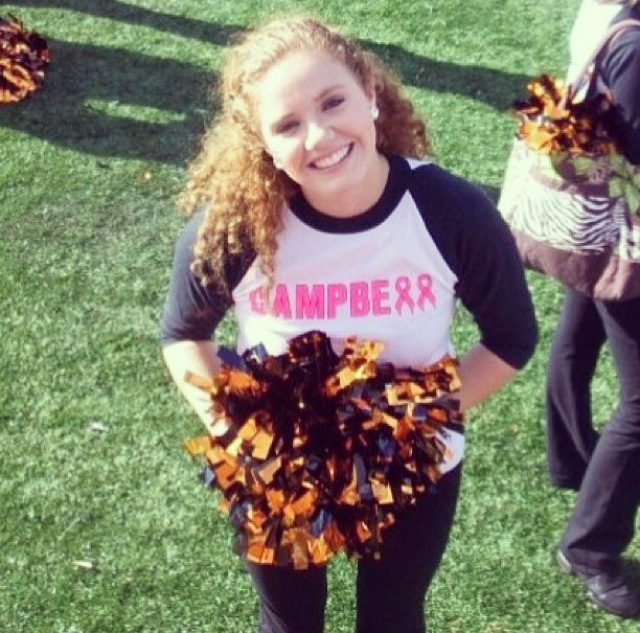 I tried out for the cheerleading team here at Campbell and didn’t make it, so it was the perfect opportunity to pursue my dancing career when I met Lauren Dixon. Q: Was Campbell your first choice? A: No, actually App. State was my first choice. I applied to App. State and UNC Charlotte and got into both. I’m from a small town and I am kind of a home body, so when I went to visit these campuses it really surprised me how large they were and the type of environment it was. It wasn’t personal at all, I felt like more of a number than a student. From that point forward I knew that those schools were not for me. When I visited Campbell and saw my name on the sign I felt at home and it was exciting. It was definitely something that drew me in more to choose Campbell University. Q: Is there any advice you can give for an underclassman who wants to commit to a sport, club sport, or intermural while juggling the heavy work load from their courses? A: I would say if you wanted to do a club sport, then you need to prepare yourself. Find your own groove, it may take a little bit, but when you do it will be a lot easier to see what you can handle and how much you can take on. The coaches and directors are expecting you to be fully committed, so if you have to reevaluate yourself to see how much you can handle, then do it. Don’t ever take on a task that you know you are not fully capable of committing to. Q: Not only are you captain of the dance team, but you are also representing the school. How high is the stress level of being a role model to your teammates as well as being a representative of Campbell University? A: I actually recently got nominated to be president of club sports, so that was a little stressful. But having to deal with maybe even telling your roommates and your friends what to do was sort of a struggle. Finding that balance of yes we are friends, but when it comes to practice time we need to get serious and I need to be that authority figure to get things done was definitely hard. It’s very stressful ordering uniforms, making sure you have practice on time, and dealing with the liability forms as well. I realize it’s all worth it in the end because that feeling I have when we hit the field and perform is not a forgettable feeling. Q: How excited are you about the upcoming competition season? A: I’m excited because we just had our very first competition last year, we went to cheer sports in charlotte and won, and now we have a bid to be able to go to Atlanta Georgia this year! It’s going to be nerve racking but very interesting. A: Yes, my freshman year I was running around with my roommate, and I found the egg that has the free t-shirt in it. This year I went to the paint party and mud volleyball. I normally just kind of watch my friends participate in the events and it’s normally a lot of fun just to go out there and support them. Q: What event do you look forward to each year? A: I always look forward to basketball season; it’s a lot of fun. During basketball season we do education day, which is where all the kids in Harnett County come to the convocation center, the women’s basketball team performs, and the dance team and cheerleaders perform for the kids. It’s so much fun because the kids really enjoy it and ask for our autographs. It’s a really good day for reaching out to the community. But anyways, basketball is always hype and everyone really enjoys it so it’s most definitely one of my favorites. A: Yes, if I wasn’t on the dance team I would still go to all the football, basketball, and baseball games. I would try and support the teams as much as I could. It’s sad to see people get up in the middle of the games and just walk out. I know it can be upsetting sometimes if we are losing or aren’t doing too great, but it’s discouraging when the players look up and see that the people who are supposed to be supporting them are just walking out. The students are what keeps the teams pumped and without students being behind them 100% it wouldn’t give them the boost they need to continue trying. So, spirit is a big thing for me, and everyone should have a little bit of pride for their school. Q: When you hear, “Welcome to The creek! Where Hump Day is every day! !” What are your first thoughts? A: I thought it was kind of lame at first! I was like oh gosh we’ve taken the little saying from the commercial ha-ha. But it’s kind of funny now, and now it can be a cool new Campbell tradition. Q: What is your favorite thing to do after practice? A: We usually go eat something really bad for you! This past week we went to sunny skies, but since it a fairly new team we will probably go to cookout and just do homework together and bond a little. A: My favorite place off campus would be Noah’s. It’s a little Italian mom and pop restaurant is sooo good. As far as on campus I would have to say the Burger Studio, their curly fries are to die for! Q: How do you make your Campbell experience unique? A: I talk to different people, Campbell can be full of clicks and I just try to talk to everyone. We are kind of like a big family when it comes to sports, and when it comes to sports I get a big variety of different friends because I try to stay as open as possible when it comes to meeting people and making those connections.